~ Our high quality lightweight sturdy legging gaiters protect you from water, mud, snow and wind. ~Made of premium GD001 waterproof fabric, our gaiters off er you the ultimate protection. 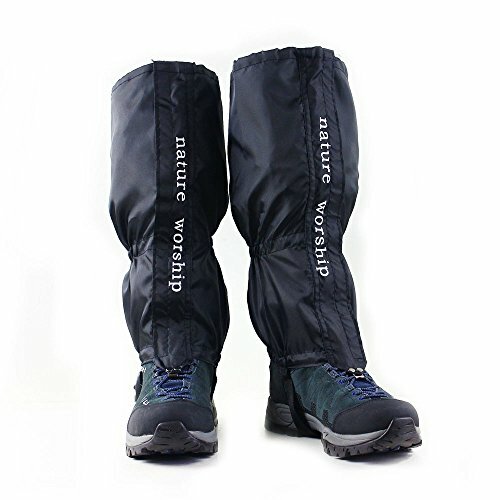 ~Our Gaiters feature an adjustable upper and underfoot straps for superior comfort. ~Dual locks for front closure, Velcro and zippers for double support. ~ Being Lightweight, allows for easy walking, skiing, hunting, or running. ~Tested to withstand harsh conditions and cold temperatures. ~ This essential outdoor product makes for easy navigating in rough terrain. The best legging gaiter on the market. ~ Lifetime Guarantee. If you do not love it, we’ll buy it back from you! Go ahead and add one to your cart today! ✔️ Made of Premium GD001 Nylon/Polyester Fabric, Breathable and Ultra Durable. ✔️ Water Proof, Snow Proof, and Wind Resistant. ✔️ Dual Locks for Front Closure, Velcro and Zippers for Added Support. ✔️Light Weight, Adjustable Upper and Underfoot Straps for Added Comfort. If you have any questions about this product by NATURE WORSHIP, contact us by completing and submitting the form below. If you are looking for a specif part number, please include it with your message.